The Angriest: Highlander: The Series: "Road Not Taken"
It is 17 October 1992, and time for another episode of Highlander: The Series. A cyclist goes on a violent rampage in a jewelry store before collapsing dead just outside. With the cyclist a friend of Richie (Stan Kirsch), he and Duncan Macleod (Adrian Paul) investigate - leading them to an old immortal acquaintance of Macleods who has spent centuries seeking the perfect super-strength elixir. "Road Not Taken" marks an improvement over "Family Tree", which in its own small way improved upon "The Gathering". 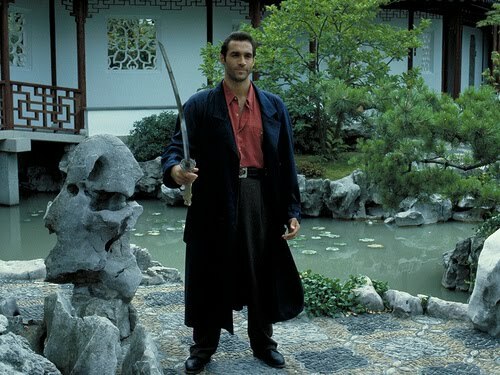 Highlander: The Series definitely appears to be getting better with each episode; in this case the episode is almost good. For one thing it involves another immortal. For another, it actually holds a comparatively complex storyline. On top of that the action is genuinely impressive stuff for a weekly television drama. It's still not particularly good television, but at least you can begin to see the good stuff in the distance. The episode has a nice wrinkle in that the mastermind behind the cyclist's death, who is using the elixir to rob a jewelry store, is not the immortal Kiem Sun but rather his human apprentice Chu Lin (Dustin Nguyen). That automatically makes things more complex than Duncan having to simply track down and decapitate an immortal villain. It also plays with the 'rules' of the Game: it is known from the original film that immortals cannot fight on holy ground, and here Kiem Sun has made his home inside a temple. It makes him safe to develop his potions without having to worry about some random immortal wandering inside and murdering him. It is slightly odd to see former 21 Jump Street star Dustin Nguyen appear as Chu Lin just one episode after fellow Jump Street alum Peter DeLuise was playing a mob heavy. It makes me wonder if Holly Robinson is turning up in episode 4. Nguyen has a much stronger presence here than DeLuise was afforded, and his climactic sword duel with Duncan is genuinely impressive. It actually looks and feels dangerous. Later scenes reveal a neat narrative twist that makes the episode feel a bit more involved than the previous two. One major problem visible even at this early stage of the series is what to do with Duncan's girlfriend Tessa (Alexandra Vandernoot). She is not being given anything to do. She embraces Duncan, and complains that he won't let her into his life enough, but she doesn't play any significant role in the plot and lacks any form of independent agency or purpose. There are clearly many things she could be doing in this or any other episode, but it is as if the writers simply don't care to use her. Instead she is left practically as window-dressing. As the only female character in the show, she deserves much better. Vandernoot clearly deserved better. While being another improvement, "Road Not Taken" still feels too cheap and awkward to recommend. If episode 4 improves as much as this one did, however, we might finally be getting to the half-decent stuff. The quality ratio remains flat at zero per cent.